If you’re like most people, lawn care slides down the to-do list as we enter the winter months. Though there’s definitely less work to be done, it’s important to attend to some tasks to make sure your lawn and other plants get through the coldest season and come back strong in spring. Taking these steps can help protect your grass even if it’s warm-season turf (like Bermuda, Zoysia or St.Augustine) that’s currently dormant. Clean up: Make it a weekly habit to remove leaves and anything else that doesn’t belong. In the spring,organic litter will form safe breeding grounds for lawn funguses. Fill in any sunken areas to prevent water from pooling and freezing there. Warm-season grass – check your equipment: If your grass is dormant, spend some time doing routine maintenance on your lawn mower and other equipment. If you can cross jobs like cleaning undercarriages, changing oil, and replacing worn or damaged parts off your list now, you’ll be ready to get back to the regular lawn care schedule when it warms up. Your other plants have specific needs, too. Watering: A thorough watering before temperatures drop below freezing can help to protect roots.Soil can absorb and store heat more efficiently when it’s wet than when it’s dry. Mulch: A fresh layer of mulch will also help to retain moisture and keep the temperature of the soil relatively stable. Bundle up: Protect the trunks of young trees and shrubs by wrapping them from ground level to a height of about four feet. 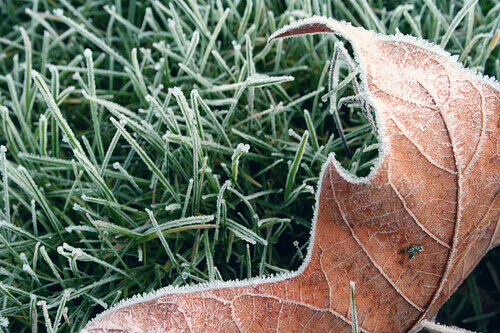 When frost is expected, cover vulnerable plants like citrus trees, azaleas, and hollies. You can find plant protection bags and trunk wrap at any garden retailer, or you can improvise with cardboard or newspaper for trees, blankets for plants, and burlap for either. Vegetables or seedlings should be protected with a loose layer of pine or wheat straw. Winter is a welcome opportunity to prioritize tasks other than lawn care, but taking the whole season off will jeopardize the results of the labor you invested during the other seasons. With this trimmed-down list of tips, you can ensure that your lawn stays healthy this winter and will emerge lush and green again when the weather warms up.